"Gainsight gives you the insights!" Gainsight has allowed our Client Success team to manage our clients through and through. The tool is key to managing our client life cycle from initial engagement, through implementation and Go Live stages, and following through to Renewal. Being able to trigger tasks for CSMs based on usage and on life cycle stage has been crucial. The customer support is fantastic. The Support desk communicates frequently when working through submitted tickets and our Client Success Manager thinks outside the box when making strategic recommendations for our business. It's not really a "dislike" as this should be expected, but you really have to put a lot into it to get a lot out of it and to drive full adoption among users. Go for it!! Be sure to dedicate the time to the set-up in order to get the most from the product. Initially, we needed a tool to centralize our client data as well as keep our Client Success team organized with their tasks with managing so many clients. We continue to solve for other problems year over year as our Gainsight CSM digs into our business needs and opens the door to features that she feels would best suit us. Next up is utilizing co-pilot to it's fullest so that we can better manage our low-touch clients. "Indispensable for Customer Success "
Having real-time data analytics based on the KPIs we specified that monitor the health of the customer and automatically trigger alerts, tasks and/or playbooks to act accordingly that are visible all the way up to managers and executives. This gives the team the ability to know what's going on with the customer so they can be proactive and know where to focus their time and energy. What I like second best is the true, 360 degree view of the customer so the CSM can be readily prepared for any customer interaction. Email Assist template functionality is severely limited and can only be attached to Playbooks. Users cannot select a template, so the administrator has to create multiple Playbooks and/or Success Plans to create any variation. Success Plans cannot be cloned and have to be built from scratch to accommodate the variations of email templates you may have. I was not part of the selection process but am thrilled with the implementation, training and support from Gainsight and the overwhelming positive reaction from our Customer Success Team of 100+ users. We have just implemented Gainsight but our VP of Customer Success has used it for years at another business. With his experience and my comprehension of the platform and business, I'm confident we'll see great results in Retention, Efficiency and Expansion. "With Gainsight, I can focus my attention where it's truly needed: Customer Outcomes." Before Gainsight, I was frustrated by our customer success efforts (speed, scope, outcomes). After successfully launching Gainsight, my frustrations have evaporated. I'm absolutely delighted that I can track our Customer Success initiatives, predictive analytics and insights, and customer health indicators from anywhere, from any of my devices, and all in real time. Using Gainsight feels effortless. I would definitely make this purchase again! The capabilities and benefits of Gainsight as a Customer Success/Insight solution far outweigh any limitations, which are primarily minor technical or UX and UI concerns. Gainsight has been responsive to these minor irritations. Before Gainsight, I was frustrated by our customer success efforts (speed, scope, outcomes). After successfully launching Gainsight, my frustrations have evaporated. I'm absolutely delighted that I can track our Customer Success initiatives, predictive analytics and insights, and customer health indicators from anywhere, from any of my devices, and all in real time. Using Gainsight feels effortless. I would definitely make this purchase again! That said, please understand that the primary challenge to successfully implementing Gainsight and realizing consistent/ongoing value has nothing to do with Gainsight itself; rather, it is your own readiness to transform business and operating models, as well as culture. Our business (and industry) is still transitioning from physical product/on-prem business models to a SAAS/Subscription model. Before implementing Gainsight, we managed our Customer Success efforts as best we could (with imperfect tools and difficult-to-reach data, sourced from dozens of separate systems). Thanks to a well-planned and executed implementation of Gainsight, we now have several current as well as predictive measures of customer health, churn, value, etc. "The CS Journey has begun..."
What we like best is the flexibility and innovation of the Gainsight platform that allows us to aggregate customer data that lives in multiple places / data sources, make it easily available on-demand to those interested (e.g., account management), and then hook up triggers (calls to action) that inform us if something bad happens (risk event) or something good happens (opportunity event). There were some data sources that were difficult to bring into the platform, such as SalesForce Community data. This was very difficult and we could only bring in limited information. The business problem we are trying to solve with Gainsight is protecting our baseline renewal revenue, which is becoming a larger portion of our overall revenue through time. We must do everything to protect -- and expand -- our recurring revenue stream. "The BEST Customer Success Tool - Endlessly customizable for your needs"
Gainsight is an incredible tool. Our ability to manage risk and drive renewals is incredibly robust thanks to the automation and excellent features from Gainsight. The tool's repertoire of features has grown faster than our Customer Success business processes, which leaves us always finding new ways to succeed without waiting for new development. We strongly benefit from the survey tool and scorecard functionality. Gainsight's only drawback is its tendency to drop unused features silently and allow them to become out of date or out of touch with the rest of the platform. I would love to see a more coherent plan with some features, but I think that is not compatible with Gainsight's vision of trying to lead the bleeding edge of customer success. Be sure you can devote staff time long term to updating the tool, reviewing new features, and adapting your business processes to match. This platform has allowed our CSMs to handle larger workloads and service more customers with less effort consistently. No other tool has allowed us to automate the repetitive aspects of customer success while concentrating our human efforts on the customers that matter most. "Gainsight has positively changed the way we work with our customers"
The ability to automate actions based on scenarios and triggers. The reporting and dashboard functionality is great. There's almost too much information to look at! The limited layout options on c360 page that could be improved to stop the need to view accounts in Salesforce. Most of the time we're in Gainsight, but sometimes we have to view info in Salesforce. We wanted a tool that could help automate many business processes, to encourage consistency in managing risk or expansion scenarios, and to help us scale our efforts as our customer base continues to grow. We're becoming a lot more sophisticated in our approach to working with our customers. "The gold standard for Customer Success teams that keeps getting better"
Gainsight is easy to set up and CS teams can get initial value very quickly using basic functionality. It is packed with advanced functionality that can take time to design and implement, but Gainsight offers a lot of self-service resources and best practices templates to assist with this. Reporting is pretty robust, but it can take some time to master the framework for designing effective reports and dashboards. Compared with Salesforce.com, the reporting model is more centralized for admins, and doesn't give individuals the flexibility to create their own reports on the fly. Provide visibility into customer health and engagement; operationalize and standardize our CSM engagement model for customers at different lifecycle stages and in different segments; communicate with customers at scale; collect and analyze customer feedback as part of our NPS program. "Gainsight is a great tool to utilize data to better your business"
Gainsight has continued to progress and build their product out. It allows a lot of flexibility in terms of accessing the data you need in order to proactively reach out to at risk customers and leverage your best customers as potential references. The calls to action allow our CSMs to be notified and get in touch with customers in a timely manner. Gainsight needs to focus on solving customer issues and developing the tool with the customer focus in mind. Some of the reporting formatting is limited as well as options for the success snapshot. We use the journey orchestrator to automate outreaches to our customers. We also heavily utilize the timeline functionality to keep record of our accounts for seamless transitions among our CSMs. "Great platform for ensuring customer success best practices"
I like that there are so many areas which will support customer success best practices even though we can only bite off a couple of the pieces right now as we deal with resources to implement as well as considering that we cannot overload our CS community with everything at once. The constant features which are being adding that allow for advancement in these areas gives me confidence that we chose the correct platform not just for today but for years to come. The ease in which to stand up platform and make changes when needed is awesome. I wish they could have been more prescriptive as to the structure of our data based on our business model. I will admit that may have been due to the fact that we thought we could do the bulk of the work ourselves at the onset but now we need to leverage best practices and for that we need outside experiences. Start going as fast as possible and iterate quickly. Bring Gainsight in to validate what you are doing for the objectives you are trying to reach. We want to reduce our churn and uncover expansion opportunities. We have begun to get a more quantitative understanding of our health status for each of our customers. "Enabling Customer Success with Gainsight"
The dashboard views are great along with the ability to hook into some of the internal data we use to track customers. The renewal charting is an easy way to see which accounts I have up for renewal and where to focus my efforts. It also allows me to plan accordingly into the future and how I can utilize my time most effectively. Co-pilot could be a little more useful in terms of email tracking, especially if there was some sort of gmail plugin that would allow you to compose emails and have them tracked for open rates, click rates, etc. Additionally, the tool can be a little clunky at times and give repeated error messages. I sometimes find navigating to things like Playbooks not nearly as intuitive as I feel it could be. Gainsight has been quite helpful in getting a birds eye view, but still lacks in certain areas. Improvements are being made for the better. Keeping a pulse on customer health based on a number of factors. We ultimately use it to make sure our customers are utilizing our products in the best manner, while enabling them to be successful. "Customer Success Manager that works with GainSight over a year"
A really good additional layer above SF for Customer Success Managers. The Cockpit concept is an excellent idea with all predefined playbooks (customer journey, renewal, Executive Business reviews etc,). Very dynamic and easy to use. The Cockpit concept is a good approach and solution for managing a huge amount of customers altogether. In addition, the timeline is a good start for auditing all important activities within an account (such as when our kickoff meeting took place, status meetings, EBR etc.). It is a very useful for auditing purposes, collaboration and transferring account between CSMs. Performance should be dramatically improved. In addition, an excellent UX/UI designed should be recruited in order to convert GS to 2018 standard in terms of the end-user experience. I gain value from using GS. That being said, be patient with the UX and the performance. 1 single platform for managing an account. Transpersicny between my self and my manager. Tasks management platform with automatic tasks (CTAs). "Gainsight Experience as a Gainsight Admin"
I like that they are constantly trying to improve the product, so we can grow our success team as Gainsight grows. I also like how responsive their support team is. I don't like how things can be very disconnected. When working with the MDA, its hard to pull in other data, such as SF data, without creating more tables to then copy data into. Also, all of the Advanced outreach details are very difficult to report on because they are all silo'ed in separate tables. Gainsight has allowed us to grow our success team and give our CSMs more time to actually be proactive vs reactive. This has allowed us to really see the benefits a CSM can make to a customer. "Fits the needs of a rapidly growing team." Gainsight is a great tool for ensuring that all of your accounts are in good health and that they are each getting the appropriate touches from your company and CSMs to keep them finding value. I've implemented Gainsight twice and saw a huge improvement in how fast Gainsight can help a customer get up and running. They really have dialed in their on boarding process which was something that I found pretty challenging the first time around. We purchased Gainsight to help solve three problems. 1.) Make the lives of our CSM easier. 2.) Help manage the team and a metrics and activities that mater most. 3.) Create a very clear picture of the health of our customer base. Gainsight has some great features for automating workflows and creating triggers for employees to follow-up on. I'm most impressed with how advanced we can make email automation to reach a larger number of customers and continue to engage or not based on conditions we've defined. There is lot we can customize to target specific segments and achieve outcomes. As an admin, I've really appreciated the new Analyzer tool that can show me which workflows are inefficient and offer suggestions for improvement. Overall, I like how involved Gainsight is with us as a customer. There are some limitations on email and CTAs that might be unique to our environment but have hindered full adoption. We'd like our CSMs to be able to not have use their email inbox and be able to cover for OOO using our standard inbox but we can't specify this within Gainsight. There are some limitations in reporting that would help us immensely if they were implemented and occasionally there are inconsistencies in the UI (settings for one function are different than the same sort of settings for another function). We've overcome these limitations but it does hinder adoption as well as the ability to train new user/admins. Work on incorporating one feature at a time as it can quickly get overwhelming. Gainsight Support and the Community are very helpful - I like that the product teams are active participants on the Community. We've been able to automate and scale many of our workflows especially in relation to routine transactions which has freed up time for more proactive engagement. We also have been able to collect and consolidate data in order to identify trends within our customer base. Gainsight opened my eyes to the true impact of Customer Success. Through a strategic advisory engagement, we were able to better understand how to communicate value to our customers, segment our customers to develop more specific strategies, and begin to align best practices as a Customer Success team. Gainsight coached us through identifying the biggest areas of opportunity and provided excellent knowledge and exciting potential solutions through their software platform. Our team has not yet implemented Gainsight software. We are early in our Customer Success journey, and the team today is very reactive. We have contributed to great growth in the business already, and we are looking for ways to continue that growth while becoming more efficient and effective as a team. We have turned to Gainsight to learn how to be more proactive and strategic with our business. We have made great progress in the knowledge around Customer Success but have not yet put a lot of our recommendations from Gainsight into action because we have not yet implemented the software. The best thing about Gainsight is how granular you can get with reporting. Our CSM dashboards help us get a good handle on where our customers are in the success cycle. We are also able to standardize success plans and playbooks which help keep all of our CSMs on the same page so that we can keep unified success metrics. The problem with Gainsight is that is is so robust that it is easy to screw up if you don't understand the system well before you begin utilizing. We have hundreds of useless power-lists that we now have to go back and groom because we did not understand the process end to end. Perhaps additional training should be stressed. We use Gainsight to keep our CSMs on the same page. We use it to manager customer relationships and analyze risks across all of our customers. It helps us with enablement, engagement, adoption, and more. Having everything visible about a customer in one 360 view. The Timeline functionality is helping our CS team keep customer notes in a central place, reducing the amount of siloed information. We like the ability to build a customer health score based on data inputs from various sources. Auto-triggered CTAs are helping our teams stay on top of customer issues that they didn't have access to beforehand. Gainsight's support team is extremely responsive and helpful. A few things could be improved. We're leveraging Gainsight on custom Salesforce objects, which makes configuration more complex, and not all features are currently available to us. The platform can also be a little slow at times. I would love for Gainsight to sync with our CSM's calendars and email accounts - this would make it much more easily integrated into our ongoing CS processes. Given the robust functionality and change management required, it is a pretty time-intensive system to implement and maintain, but you get what you put in. We are trying to grow and scale our CS org processes, improve our renewal rates, and improve visibility into customer risks so we can mitigate them quickly. For the CSMs who are using Gainsight regularly, we see that they are able to be more proactive with their accounts. We're also seeing improved consistency in the customer lifecycle and designated touchpoints. "Gainisight has changed our business"
The ability to pull in data from all sources and have everything in one place for a true customer 360 view. I also like the ability to share dashboards and customer 360s with external users. The dashboards look great and the functionality is great for sharing information cross departments. The new features in the admin area are becoming less and less intuitive. I also wish they offered certification courses or in person training courses. If you're familiar with SFDC, I would suggest having the admin go through more than just the onboarding training. The admin side is very different than any other database I've worked with. We now have the ability to see everything that our customers are doing to have better conversations with them. "Vice President of Client Services for a SaaS based software platform"
Gainsight provides the tools necessary to properly manage our Customer Success program allowing our CSMs to proactively engage our client base and ensure they are adopting and having a positive experience with our products. We are able track and manage a health score based on customized scorecards specific to our business providing insight into customers that may be at risk allowing us to initiate protocols to engage and hopefully remove the client from a risk status. In addition, we utilize the co-pilot and email assist tools to effectively communicate to all of our customers at once as needed. The Gainsight team is also one of the company's biggest assets. Both the Success and Support teams are responsive, knowledgeable and helpful. We owe much of our own success to their assistance and direction they provided from the beginning. The administrative reporting tools are robust and allow us to extract the data into a warehouse to perform the analysis and calculations we need for our business, but I would like to see an improvement in the standard reporting tools to analyze retention/churn and calculate gross and net churn. Use the opportunity to improve your processes and interactions with your customers. Be prepared to ask your teams and all stakeholders including clients the hard questions: How you can make the customer experience better? What you do poorly? If you could start over today using all the knowledge you gained up until this point, how would you design the perfect customer experience? Approaching it from this direction will help ensure you go in the right direction with the Gainsight installation and setup. - Our customer success team to can track all of their communications with clients, create proactive CTAs for both ongoing communications and address clients that may be at risk, and identify opportunities for product expansion. - Access daily/weekly reports for analyzing retention/churn as well as calculate gross and net churn, granted this is done outside the product. I am confident that without Gainsight, we would not have successfully retained as many client as we have over the last 3 years. Some of the limitations with scorecards. I would like to be able to create separate score schema's that are specific to the different industries we work with as well as different scoring based on the customers stage. I would like to see the ability for scorecards to have separate schema's based on defined variables (industry, customer stage). I would also like the ability for the rules engine to modify the status of an open CTA to a different open status. This would be a big improvement in the one to many business model. "GS has organized my customer's details and AI's to allow me peace of mind in my acct mgmt efforts." I like the Cockpit where all of my action Items (AI's) can be saved. I like access to their support cases and deployment details. I dislike that while in Timeline i can have only one Activity open at a time and I cannot move it to a different window. I dislike that I cannot use color highlighting in my Activity notes in Timeline. I dislike the pre-formatted EBR deck download, bc it uses images on each slide, so you cannot edit anything that's inaccurate. I disliek that our Salesforce integration is broken ina way that makes the deployment numbers wrong or non-existent for many of my customers. Account transition to other team members is extremely simple when you've got a place housing all pertinent info/details they need to take over the account. The customer 360 view is ideal for collaboration and the Timeline area helps keep all notes and tasks in a linear format, unlike SFDC where you have to click into multiple records (Contacts, Opportunities, Accounts) to piece together what you are looking for. The worst deployment experiences of my career. This is the second company I have worked at where the Gainsight team fails at every aspect of customer service. Multiple churned onboarding managers, most of which are junior developers with no best business practices acumen, lack of responses to emails and calls, in essence the worst customer success team with a decent customer success platform which unfortunately will take over half of our contracts term to just get up and running with basic functionality. 1) Enforce weekly cadence calls because they will not follow up with you after you purchase. They will ask you to spend multiple days watching Admin videos instead. 2) Make sure to get a right to terminate clause built in, my prior company did not and stopped using the tool in year 1 of 2 contract. 3) Invision hired a full-time system admin just for this tool and is a similarly small-sized company to ours. Smart move if you want the tool to actually work and be adopted. We need a centralized, consolidated view of our interactions with our clients as well as a one-stop shop for collaboration and success plans. The Customer360 is helpful. We are sorry you had a poor experience with our onboarding team. While project delivery is an imperfect science, and clearly you experienced how imperfect we have been in the past, I would love an opportunity to introduce you to our new team and our new implementation methodology. We've made recent improvements to be very prescriptive, focused on the delivery of Customer Success best practices/processes alongside technical enablement. To that end, if you give us an opportunity, I'm happy to give you an amazing CS implementation experience on our dime. You can reach me at sshah@gainsight.com. `Certain inherent functionality is nice, like the ability to configure Health Scores based on a variety of factors, which would be a time consuming configuration in Salesforce. Also the ability to insert an NPS (or any survey) easily into an email is convenient. consider the costs and implementation time. Implementation took us a good 6 months, and now we cannot consider switching because of how entrenched we are with it, even though it is obscenely expensive. We have 3 people that manage 700 accounts. Gainsight makes it easy to keep organized with our renewals, client outreach, sending satisfaction surveys and scoring accounts to assess risk. "Fantastic experience with Gainsight Professional Services "
Great overall experience with the Professional Services team. The team was incredibly responsive, patient, and technically savvy. They made a very positive change in our instance and took us leaps and bounds forward with our Journey Orchestrator use. We are very grateful for the time and energy the team dedicated to our Professional Services project. Honestly, nothing comes to mind. It was a very positive experience. We had a broad project with multiple topics. Our main use of Gainsight is two-fold. Firstly, it is to streamline efforts of our Account Managers so they have one place to access all information for their client accounts. Secondly, we are are using Gainsight to automate communications to clients. This enables us to have a consistent line of communication with clients. "In Depth Analysis In Seconds"
I love being able to get reports on my clients within seconds, based on various segments and variations in their contract with our company. Gainsight allows me to see the forest without ignoring the fine details. Being able to keep track of my CTAs with specific steps is incredible! A lot of my job is touch and go, so to be able to track those touch and go's is HUGE! Sometimes Gainsight can be clunky when loading in multiple windows. Playing with the scroll feature can often remedy this issue. With Gainsight we allow our consultants to look at their portfolio of clients and identify when is the right time to reach out to those clients. We attempt to use Gainsight to identify "high risk" clients and create call-to-actions to attempt to reverse that negative health and turn that client into a long standing client. We also use Gainsight to help identify clients in terms of where they are at with their onboarding process. Finding clients who have been neglected during the onboarding process can be a huge detriment in the long-term life of a client. Using Gainsight we created reports that will let us know when certain clients have not been reached out to recently or who haven't completed specific steps in a CTA we created for onboarding new clients. "All your data in 1 place"
We have 6 different systems that feed client data into Gainsight, saves our Client teams a lot of time to have 1 system with all the information. 360 degree view of the client that includes objective data from our different sources as well as subjective data from the people who manage each account. Keeps Customer Success team focused on tasks at hand and being more proactive than reactively responding to emails. "Helpful, relevant tech + great people"
Leading technology in the space, they listen to customer feedback and build for our need. The dashboard views of health, activity and performance are great for visibility into team and account health. Whereas the instrumentation of activity through playbooks has really helped us scale our processes globally. Most of all, I really like the people at Gainsight, the leadership, the individual contributors, all great people. Sometimes the SLA on communication slow and the response not always what I was hoping for, but it might be due to fact it seemed they changed their support model on the sales/success side at a decent pace for a while there. Talk to other companies about what they are trying to achieve and have a smart use case deployment plan. Insight into customer data points - faster turn around to customer value creation. Knowing which customers require outreach is the key to ensuring customer success. Prior to Gainsight we were blind, we didn't know which customers required attention NOW. We also find the information regarding LinkedIn valuable for identifying new customer opportunities when one of our satisfied customers moves on to another company. Our customer newsletter increased readership and click thru rates when we moved from our marketing automation platform to the Gainsight email solution. The value that the platform has provided is evident by our NPS score. We are very satisfied with the Gainsight platform. We haven't really used the video solution but I believe that it will be a valuable tool in the future. The most important thing to do before implementing Gainsight is to know your KPIs, Customer Journey and document all your processes so that when it comes to implementation you can implement efficiently. We looked at Gainsight a year before we purchased and during that time we understood the areas of improvement, created playbooks and documented processes so when it came to implementation we were ready to go! Customer engagement is the number 1 problem we are solving with Gainsight followed by customer health score. We had a home grown solution for health score that didn't provide a real time view of the customer's satisfaction. With Gainsight integration into our back office systems we now have visibility into support, renewals and other valuable data. Right in one place when we need it. "Helps a small customer success organization to scale"
Lots of new capabilities which complement or replace prior functionality which causes us to pivot to new approach. The new functionality is definitely better, so it is worth making the shift. Devote the time needed to get the solution meeting your business requirements. Gainsight is good about assisting you after your initial implementation, but dedicating the time upfront is definitely the preferred approach. Monitoring customer activity, notifying internal team of upcoming events such as quarterly business reviews or upcoming renewals. Gainsight allowed our Account Managers and Customer Success Managers to have a visual idea on how their customers are doing, through the dashboards and the C360 view. It also allowed the company to standardize how our AMs and CSMs handle potential issues or opportunities through the use of CTAs. Gainsight Support is very proactive in reaching out and letting us know if there are any bug they have found in their system and identifies if there are active rules in our org that is affected. For other issues, their Support team is very responsive in the cases and chat and will help out in the best of their abilities to help provide resolution. It usually takes quite some time to load the Visual Force pages and the locations on where the various settings are is a little confusing. Trying to customize the product to fit our needs is a little challenging because there's a lot of custom objects in the package and we do not know what links to which object. Setup is easy to follow and Customer Support is very responsive. Knowledge base is very help and, if in case you get any roadblocks, you can reach out to your Account Manager and he will make sure that your concerns are properly addressed. For our AMs to have the visibility on their customers' account health and our CSM to ensure that every concern of their customers are properly addressed. "Great for tracking and completing customer onboarding"
IT is well thought out and makes the transition to Customer Success easy for small companies. I would make sure they document their current method of onboarding customers. Have the expectation to change pretty much everything at the beginning but know that it will be for the better in the long run. We are shortening the amount of time spent training customer but providing an easy to follow success plan for each closed opp. "(Almost) One Year as the Gainsight Administrator"
I love that Gainsight is a blank sheet with incredibly deep functionality. We can collaborate across the company to determine what the best client experience will be and then roll out at scale. Gainsight also allows a unified message and client experience. Because Gainsight is so dense, a massive question of "Where do we start" and "What should be prioritized" is ever present and a statement of of "This is the Gainsight "Best Practice" to get a lot of value in your first year" is severely lacking. Gainsight is allowing us for the first time to unify our client experience. We can collaborate across not only our Client Success Team, but Product and Marketing and have one record of truth for the roll-out of our strategy for client retention. 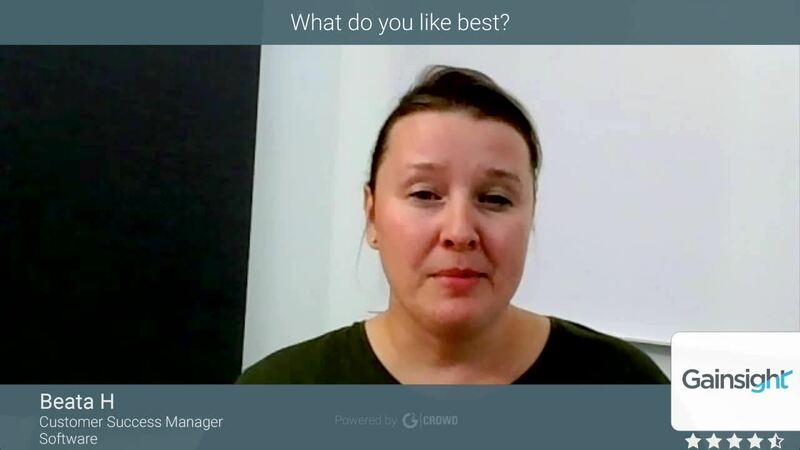 "Hard to manage Customer Success without it"
The Gainsight 360 view of a customer has become the hub for a CSM to find as much information as we can manage about an account in a single place. Once you get your lifecycle properly calibrated and operationalized into CTA's, the cockpit becomes a great center to manage your action plans from. You have to be prepared to put a lot of effort into wrangling your data to get stuff feeding into Gainsight properly. You really need the support of an analyst on your side, or you will really struggle. You will eventually get stuff in a good place, but it will take a lot of work. Better recognition of the risks in our customer base. CSM's and leadership can get up to speed on an account much more quickly. Driving consistency among the actions of your Customer Success team. "Has great potential but is lacking in accuracy "
I like that I can graph and visualize data to present to customers - which gives a great overview and understanding of their usage and where they can improve in using our platform. I do not like how the data pulled from our own system can sometimes be inaccurate. I would recommend Gainsight to work with my internal team to pull more accurate data. I use gainsight to present an overview of usage data of our platform to my customers during quarterly business reviews and when it is time for renewal and they want to understand how their reps and users are using our platform. My customers ability to see usage helps me renew these accounts. "Gainsight - Insight Into The Customer Journey"
Gainsight has allowed us to look into the customer journey in a way we never have before. It has given us unparalleled insight into what makes our customers journey one of success or failure. Some bugs have taken a lot of time to work out and also the communication between Salesforce and Gainsight could be improved. Email integration, i.e. having email sent to clients from an outside email program be recorded automatically into Gainsight notes would be unbelievably helpful. Our customer journey has gone from zero to hero. The ability to create CTA's has been huge for follow up and the ability to run in program email campaigns and surveys has been huge. "Fantastic Overview and lots of space to dig deeper"
I love the individual dashboards, that we built from Gainsight and the complete overview of Tasks and Clients. Try it out and you'll find a lot of loopholes in your own processes. Once you realize those, Gainsight helps you fix them on a daily basis. Definitely getting more efficient with the help of gainsight. Concentrating on the right tasks at the right time and still having the ability to dig deeper to learn all about the customer. I can't really imagine a world without a tool like gainsight, as we wouldn't be able to handle the volume of clients in the same quality as we do today. Had a great time meeting up with fellow CS personnel. 1000's of people, tons of CS content, networking and had the time/people to discuss CS tactical/strategic items. Also, enjoyed hearing about "Elements" and living for/with a "Purpose." I ask the question - "Who's Fired Up ?" Large sessions with 100's of people as I enjoy the small working sessions and focus groups much more. Match your requirements to the features/functions of the Platform - see if it meets your needs. Dont forget about the indirect wins of productivity, training new people on a prescriptive approach and of course collaborating and spreading a CS culture throughout your company. Consistency and productivity gains with CSMs, consolidated customer views, health scoring of customers, prescriptive approach to renewals, collaboration amongst cross-functional teams, and assisting with a company wide culture of CS. Gainsight has become imbedded in my day to day life as a CSM. My personalized, visual dashboard is my lifeline! Gainsight has truly allowed me and my team to be as proactive with our customers as possible. The automation, standardization, tasks, and surveys transform the CS process. I love how user friendly the platform is and how customizable the experience can be. I can't think of one of pain point when it comes to Gainsight. Excited to see how the company continues to add value in their product updates. Any pain poinst I can envision is if we are asked to test these product updates in the beta phase and things haven't been ironed out fully. However, I know we will be more excited to have that roadmap visibility and test the features than we will mind any pain points. Jump on Gainsight as early as possible. You will want Gainsight to be with you and your customers from Day 1 of on-boarding through renewal. Gainsight helps us better service our customers, have strong data driven customer health scores, and better identify early signs of churn and/or growth and expansion opportunities. Gainsight also allows us to implement surveys such as NPS which has become a company wide health metric. "Gainsight is a great tool for Overall Customer Success"
Gainsight allows you to customize to your own business processes and allows you to be ahead of the game with playbooks and the copilot to know how to react to different situations. This allows the CSMs to concentrate more on our customers and less on getting everything documented in an organized way. I have to say as an admin, the Gainsight support is excellent! Honestly, I have been using Gainsight for 2 + years now as an admin and from my side of things there is nothing I have disliked or see as a negative. Gainsight is an amazing tool that will allow you to automate so much of your process and allow you to concentrate more on customers and their happiness. Gainsight allows us to concentrate more on the customer and on their overall success. There are truly countless benefits and they are constantly improving on so many things! I like that it's integrated to Salesforce and helps me manage my clients more efficiently. I would like some of the features enhanced. Customer satisfaction and product usage. I'm able to effectively manage client accounts by being able to monitor support tickets, account information, and maintain a thread of ongoing notes and emails. Because of the available functionality, customers feel confident that our team is heavily invested in their teams success. "Customer Success Management Made Easy"
As an admin, I appreciated how easy it was to set up and update Gainsight. As a reporting and analytics junkie, it was great seeing the different way we could slice and dice information on our customers. My favorite part was setting up our regular NPS survey emails to go out automatically on a regular basis. This allowed our Success team to get regular feedback from customers compared to our previous, more manual, less frequent approach. I found we ran into issues with syncing large quantities of data from custom Salesforce objects. Things would error or time out on occasion, leaving us with some gaps in the information. Have your processes in place before implementing. We were able to get a more objective view of customer health and see how everyone compared in the grand scheme of things vs. just giving attention to whomever yelled the loudest. I really love all that Gainsight does for customer success as a practice, including articles and podcasts about best practices. Some of the interconnections with Salesforce is challenging to understand. Hard to stay within some of the dropdown choices set by our higher sales folks. Managing a large number of accounts and understanding where they are in life cycle. Mapping that to actions we have taken. . I love everything about Gainsight! It allows us to make notes on accounts, create follow-ups, rate their health score, organize our CTAs and links to salesforce so it saves us time. We wouldn't be able to do our jobs without it. "Gainsight helps me Help my SaaS customers!" I love the Playbook/CTAs functionality. Success plans are also great to leverage for anyone in a customer-focused direct engagement role. I would like to see some more flexibility in the cockpit section. This is a great tool for Customer Success Management as well as team collaboration. Plays great with SFDC. I manage a portfolio of over 30 customers. Gainsight helps me keep in touch with them all by providing me a tracking and organizing tool to ensure I make my touchpoints and track my notes. I really enjoy the fact that my tasks are listed with an attached due date. When things are conveniently listed, I tend to be more proactive. I appreciate that they provide the health of the current task. It is very user-friendly. Sometimes the software provides me with irrelevant or undeeded information about my accounts. This is actually a good thing, however, it sometimes is not necessary information. If there is too much clutter on the list, my tasks will not be completed at optimal speed. Making sure tasks are done in a timely manner. If a task for a certain account is not completed, it provides me with a fair warning. I make sure that all of my accounts are up to date so the information can be relayed to the sales team. It helps me maintain accounts and keep track of the products that the client is using. "Comprehensive Customer Success Management platform"
The ability to define and monitor Client Health is a key feature. Great analytics and trending, as well as helpful reporting and dashboard interfaces. We have also migrated our Product Release announcement process to Gainsight so we can do more targeted communications to key users. Data management is always a consideration with these types of tools. You will need support from your Salesforce Administrator for ongoing evolution of the rules and calls to action. I would also like to see more development on the NPS module. Gainsight helps us proactively manage the long term customer relationship. We use it to mitigate churn and conduct early outreach on upcoming renewals. The insight on usage trends has helped us have more meaningful customer conversations and increase our renewal rate. "Horrible Roll Out, Lacking Support and Poor Customization"
Not much - everything I've found useful is something OUR dev team had to build and was essentially a flaw that Gainsight couldn't fix for us, so we did it ourselves. It's a good tool for making investors happy and a very, VERY expensive version of Slack or Asana for to do lists. About 99% of it. Our rep is really ill informed and has had to ask for help or for us to wait on a response about every third question. We arent' receiving what we were sold on, but now that this thing has been forced on the whole company, we're doing our best to make use of it. That said, none of us are recommending renewal. Ask for a 3-6 month period (depending on the size of your organization) - if they can't get you up and running in that time, they're not a fit. Get as many end users involved as early as possible - Gainsight doesn't have enough best practices in place to help you discern end results without testing and troubleshooting with your team. The cost is far too enormous to have wasted the time, money and effort on doing what they should have helped us with right out of the gate. None. There's something to be said for the vision they're selling - that you can find the triggers for upsell and forecast pain points, but we're not a wildly unique organization and yet they can't really help us to customize the reports or what we've already identified as opportunities and pain points. Our AI and human discernment is better than anything they've even been able to propose, let alone build for us. "Getting a ton of value out of Gainsight"
Breadth of the solution and ability to customize it to exactly meet our needs. Our CEO looks at our dashboard every day (even weekends). It helps us understand what customers are successful, which are struggling, and what we can do to get them on the path to success. Initially, the documentation lacked context regarding how certain functionality applies to us. This slowed our implementation somewhat as we needed to do our own discovery. Recent updates to the documentation have shown great improvements in this area. Do your homework regarding how to optimize your processes so that you're implementing a good process from the beginning. Make sure you have good support from your Salesforce team so that you can implement changes that will benefit your Gainsight implementation. Don't be afraid to reinvent your processes on a regular basis. Dinosaurs get left behind. Gainsight is flexible. You need to be as well. Identifying slow adopters early and customers who are struggling to reach their desired outcomes. Providing insight to senior management, the board, and sales leadership regarding renewal forecasting. Giving CSMs a repeatable process to follow. Giving CSM management the ability to understand whether CSMs are following the process so they can coach those who may need assistance. Helping our Support, Operations, and R&D organizations see an overall view of customer health and where TLC may be needed. Gainsight allows our team to know which customers to reach out to and when in order to maintain and grow relationship. Gainsight also ensures that each customer is getting the same experience by putting our processes to work for us using CTAs. In addition to the features of the software, we also enjoy the partnership of the entire Gainsight team! This partnership has changed the way we view customer success and the way we treat our customers. While Gainsight has made great strides recently on this, more documentation around the product's features would be helpful. Do your homework upfront before going to the Express Workshop, if you can. Having your processes and playbooks mapped out will help you when it comes time to implement. Gainsight allows us to show value to our customers through strategic interactions using CTAs. The customer healthscore that Gainsight shows enables our CSMs to focus in on customers that may be struggling or at risk of churn. * We monitor all Gainsight reviews to prevent fraudulent reviews and keep review quality high. We do not post reviews by company employees or direct competitors. Validated reviews require the user to submit a screenshot of the product containing their user ID, in order to verify a user is an actual user of the product. Hi there! Are you looking to implement a solution like Gainsight?